Whilst living in Tokyo, Japan in 2005 Kelly was taken along to a yoga class by a friend and fell in love with the practice. It was challenging both physically and mentally yet there was something else that pulled her back time and time again. In India, several years later, Kelly deepened her knowledge and practice of this ancient discipline – truly uncovering the magic that yoga has to offer. Settling back in Adelaide after her extensive travels, Kelly underwent Hatha 500hr Teacher Training, later followed by Pre/Postnatal 150hr, Restorative 20hr, Power Living Vinyasa 200hr & Advanced Assisting 30hr. For Kelly, her yoga journey is ever evolving. She is a warrior for self acceptance and authenticity. Kelly is especially passionate about empowering mums and mums-to-be on their sacred journey & to fully step into their power as life givers. 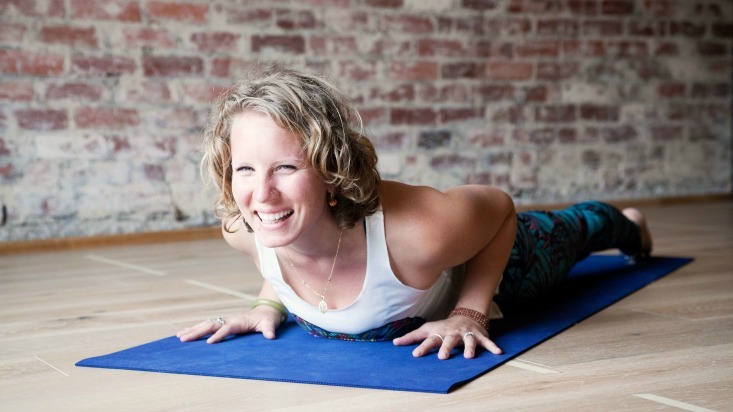 Kelly teaches with a down-to-earth manner that is authentic, intense and nurturing. She provides space for people to be truly honest in themselves and to step into their fullest power – both as individuals and in their daily lives. Kelly wants the practice of yoga to awaken people to their potential and to be present to the fullness of their lives. Travel, take my fur babies to the beach or park, study Hindi, watch movies and hang out with my husband.